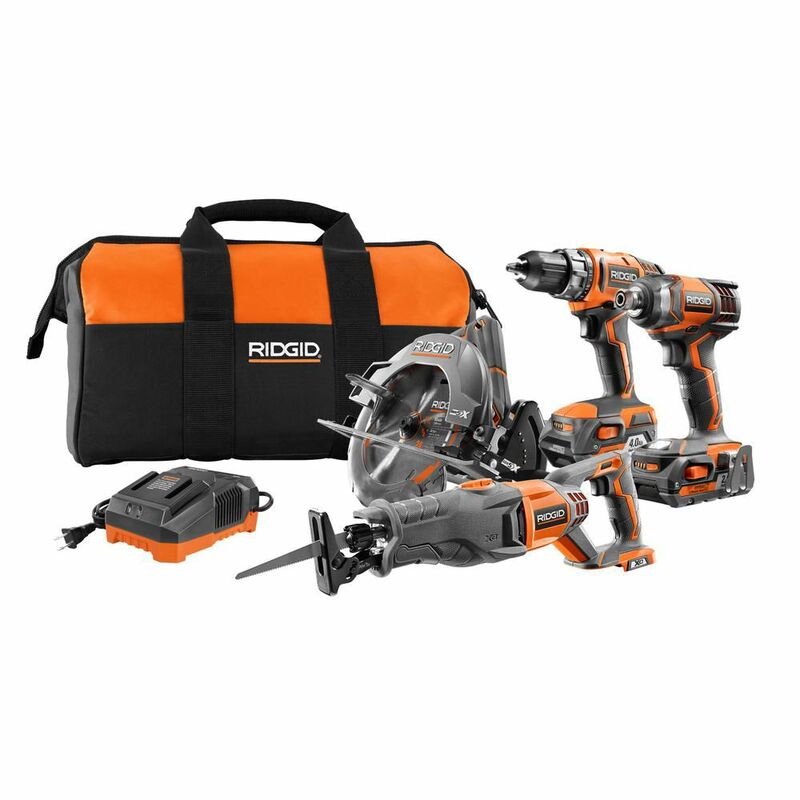 RIDGID introduces the 18V Lithium-Ion Cordless 4-Tool Combo Kit with Drill/Driver, Impact Driver, Reciprocating Saw, Circular Saw, 2 Batteries, Charger, and Carrying Bag. The 2-Speed Drill/Driver can tackle both professional jobs and home projects. The Impact Driver is the most compact 18V Impact Driver in its class with superior power-to-weight ratio. The Reciprocating Saw features orbital action for exceptionally fast wood cutting. Finally, the Circular Saw includes an integrated dust blower to keep the cutline clean. Backed by the industry's only Lifetime Service Agreement - register to receive free parts and service for life. The Kit incldues a 2-Speed Drill/Drivert, an Impact Driver, a Reciprocating Saw and blade, a Circular Saw with blade, 2.0 Ah Lithium-Ion Battery, 4.0 Ah Lithium-Ion Battery, an 18V Charger, two belt hooks with screws, a carrying bag, and an operator's manual. Makita is the innovation leader in Brushless Motor technology and the 18-Volt LXT Brushless 2-Piece Combo Kit (DLX2176T) gives you two brushless solutions for drilling, driving and fastening. Each tool features an efficient Makita BL Brushless Motor that is electronically controlled for longer run time, increased power and speed and longer tool life. The combo kit includes a 1/2 inch Hammer Driver-Drill with a full 1,090 in. lbs. of MAX Torque for the most demanding applications in wood, metal and masonry. The kit also includes an efficient and compact Impact Driver with up to 1,550 in. lbs. of MAX Torque. The 18-Volt LXT Lithium-Ion 5.0Ah batteries have the fastest charge times in their category and for increased convenience they include an on-board LED charge level indicator. For improved tool performance and extended battery life, Makita created Star Protection Computer Controls. The 2798-22CT M18 2-Tool Combo Kit includes the 1/2-inch Compact Brushless Drill Driver (2701-20) and the 1/4-inch Hex Brushless Impact Driver (2750-20). The M18 Cordless System's patented technologies and electronics, innovative motor design and superior ergonomics provide the most efficient blend of power, weight and performance in the industry. The M18 1/2-inch Compact Brushless Drill/Driver is the Most Compact 18V drill on the market and delivers Over 50% More Run-Time than drills with brushed motors. The M18 1/4-inch Hex Brushless Impact Driver is the Most Compact Impact Driver in its class and delivers Over 50% more Run-Time than Impact Drivers with brushed motors. Both tools feature Milwaukee built brushless motors, REDLINK Electronics and REDLITHIUM batteries that provide more efficient power delivery, for fewer trips to the charger. This Milwaukee M18 Two-Piece Cordless Lithium-ion Combo Kit includes the 1/2-inch Hammer Drill Driver (2602-20) and the 1/4-inch Hex Compact Impact Driver (2650-20). The M18 Cordless System's patented technologies and electronics, innovative motor design, and superior ergonomics provide the most efficient blend of power, weight and performance in the industry. Powered by REDLITHIUM the M18 cordless system delivers more torque, more power, and longer runtime than the competition. This Milwaukee M18 cordless Lithium-ion two-tool combo kit includes the Compact Driver (2601-20) and the 1/4-inch Hex Impact Driver (2650-20). The M18 Cordless Lithium-ion System's patented technologies and electronics, innovative motor design, and superior ergonomics provide the most efficient blend of power, weight and performance in the industry. Powered by REDLITHIUM, the M18 cordless lithium-ion system delivers more torque, more power, and longer runtime than the competition. 18V 4-Tool Combo Kit with Drill, Impact Driver, Recip Saw, Circ Saw, 2 Batteries, Charger, and Bag RIDGID introduces the 18V Lithium-Ion Cordless 4-Tool Combo Kit with Drill/Driver, Impact Driver, Reciprocating Saw, Circular Saw, 2 Batteries, Charger, and Carrying Bag. The 2-Speed Drill/Driver can tackle both professional jobs and home projects. The Impact Driver is the most compact 18V Impact Driver in its class with superior power-to-weight ratio. The Reciprocating Saw features orbital action for exceptionally fast wood cutting. Finally, the Circular Saw includes an integrated dust blower to keep the cutline clean. Backed by the industry's only Lifetime Service Agreement - register to receive free parts and service for life. The Kit incldues a 2-Speed Drill/Drivert, an Impact Driver, a Reciprocating Saw and blade, a Circular Saw with blade, 2.0 Ah Lithium-Ion Battery, 4.0 Ah Lithium-Ion Battery, an 18V Charger, two belt hooks with screws, a carrying bag, and an operator's manual. 18V 4-Tool Combo Kit with Drill, Impact Driver, Recip Saw, Circ Saw, 2 Batteries, Charger, and Bag is rated 4.8 out of 5 by 54. Rated 5 out of 5 by Phil from The kit was great. delivered quickly. ... The kit was great. delivered quickly. Rated 5 out of 5 by Jhawk from Great product and even better warranty! Great product and even better warranty! Rated 5 out of 5 by Birddog1 from I have used everything but the drill , only reason I haven't used the drill is because I already ... I have used everything but the drill , only reason I haven't used the drill is because I already have three other rigid drills . Everything works as it should , I am especially impressed with the circular saw , the run time is amazing compared to the other brands I have had . So far I am impressed with Rigid and the warranty , unbeatable !